You are here: Home / Magic Love Bus Journey / The LovEvolution and the Magic Love Bus roll on. The “LovEvolution” that the Magic Love Bus promoted from coast to coast in 2012 continues to grow in the hearts and minds of millions around the world. The LovEvolution, which is conscious evolution through love, has existed for centuries and is gaining momentum. 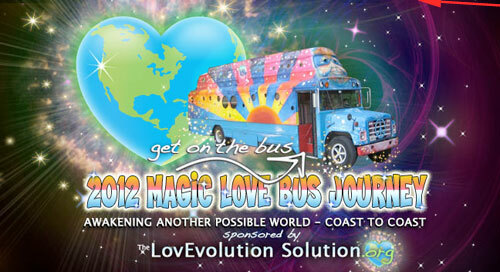 The below video features highlights from the “2012 Magic Love Bus Journey”, including the theme song of the LovEvolution written and performed by crew member Jennifer Youngs as we crossed North America. The Magic Love Bus is currently in Asheville, North Carolina, where it will be supporting community events and festivals, while inviting all to “Get on board for the LovEvolution”. May the LovEvolution live in your heart no matter where you are or where go.